NEW Products for Treg Research! At Tonbo Biosciences, our Research Generics™ provide you with the identical, high quality, high performance products you may currently be purchasing from a premium priced supplier, but at a significantly lower price. We now offer key reagents for analysis of Treg cells, including Mouse Foxp3 and Mouse TIGIT. Our high performance Transcription Factor Buffers and Solutions are formulated for optimal resolution and low background. Coming soon…Human GARP! Same Clones, Outstanding Quality, Exceptional Value…Why Pay More? 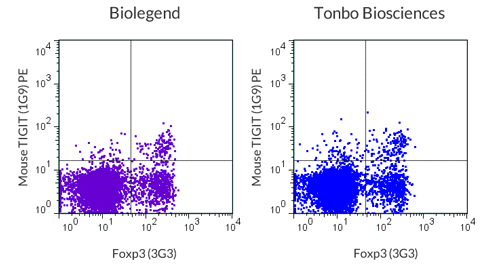 Comparison staining using PE Anti-Mouse TIGIT (1G9) manufactured by Tonbo Biosciences (right) or BioLegend (left). C57Bl/6 splenocytes were stained with FITC Anti-Mouse CD4 (GK1.5) and APC Anti-Mouse Foxp3 (3G3). Cells in the CD4+ gate are shown.